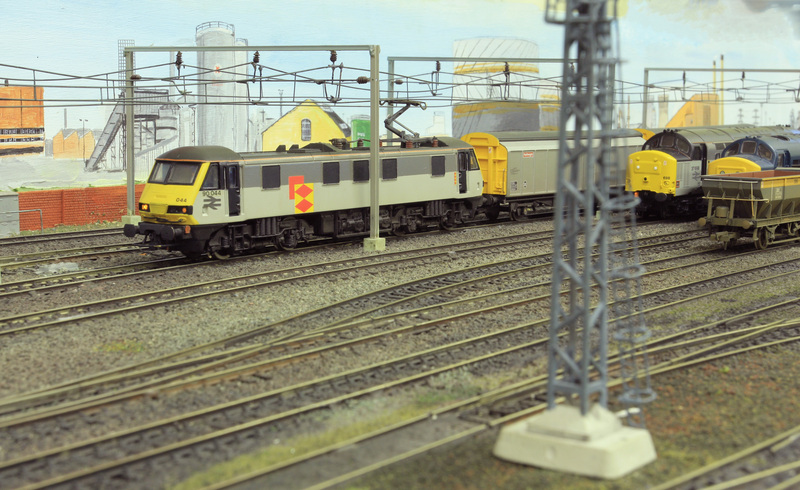 Mossbank Yard is a very large modern image layout depicting BR Speedlink times around 1980 to 1995 and privately owned by a club member. In one section there are no less than nine parallel tracks on this busy railway. The layout measures 31ft x 2ft and with all this complexity DCC control is a must - six operators are required for a two day exhibition. Club members run just about every class of diesel and electric locomotives many of which are modified RTR by either weathering or resprayed. Rolling stock is also either modified RTR or scratch built. There are several local details to compliment the main railway: a canal basin with locks and long boats, a private chemical siding and a private distribution facility as well as the general cabins and infrastructure you would expect to see in this environment. There is a predetermined operating system, for Mossbank Yard. All the stock used is known to have run in the area during the period modelled, and the operating sequence tries to adheres as closely as possible to the running of Speedlink and its successors. Freight traffic arrives at Mossbank from either North or South in the reception sidings, and is either re-marshalled in Mossbank Yard or held for loco or crew changes before recommencing its journey. Passenger services are handled by DMUs passing by on the through line, and even overhead wires are installed on both the through line and the reception sidings supplying power for AC electric classes. All movements are controlled by fully operational colour light signals by Roger Murray and backscenes are by Adrian Cox. And if all that is not enough, for a grand scale Mossbank yard can be connected to other clubs layouts Hollybank Depot and Westcliffe CCE Yard to present a super layout.